Multiple marching styles are available for you to choose from. By default, performers marching in the Real View will march with a bent knee style and jazz run when necessary. You can, however, specify for percussion to march with a crab step, or have the performers march with a traditional style high step. 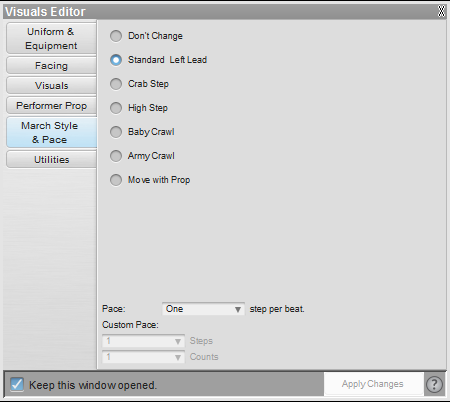 To change the march style of performers, select the performer(s) and open the Visuals Editor tool. On the March Style & Pace tab, choose the style you want performed and press Apply Changes. Performers can march single, double, or half time, based on your input. To change the pace of a performer, select the performer(s) and open the Visuals Editor tool. On the March Style & Pace tab, choose the pace option you would like from the menu and select Apply Changes. Once a pace has been applied for performers, they will continue marching at that pace until the pace has been adjusted again. *All changes in the Visuals Editor are based on the location of the Yellow and Red Anchors on the Count Track. Because of this, march style can be changed throughout the drill. There is no restriction on how many times marching styles can change; just be sure to have your anchors on the Count Track in the correct location where the change will occur! If you are setting a default for the file (such as March Style), make sure the Red Anchor is at count zero. If your anchors are spread when you change the style, the style change will apply to that transition and from that point forward, or until another change is made.